Soccer is a game of wits, stability, endurance, and stamina. So, you’ve made it into your high school/college soccer team and you want nothing but the best soccer shoes for your money, but how do you know which ones are actually the best? This guide is by no means a be all and end all list of soccer cleats, but they it does give an insight into some of the best soccer cleats out in the market today. Whether you’re looking for women soccer cleats or men’s, your requirements will remain basically the same since a good design and top-quality craftsmanship are key to giving the wearer an edge on the field. Note: We based our criteria on the combined value of comfort, design, and performance they offer to the wearer and even though the final list won’t satisfy all tastes, you’ll end up finding something you’ll like A LOT. You may recall seeing these bad boys before, and you probably have – way back in 1998 when they were all the rage during that year’s world cup. 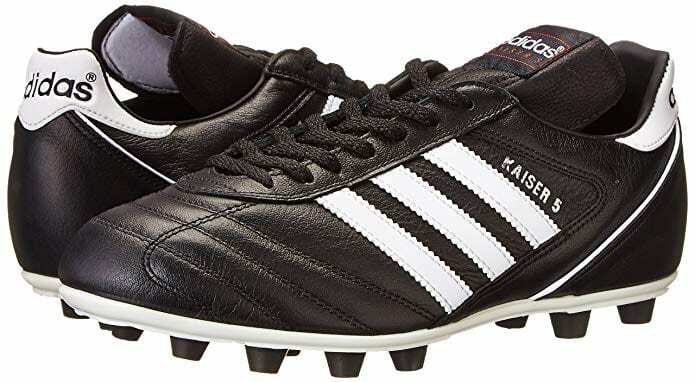 There’s a reason the Adidas Kaiser 5 Liga 98 is a classic and it’s not just because they were part of some of the most memorable goals in history during the 98 World Cup, but because they deliver at every step with their no-nonsense look and superior comfort. They are the best soccer cleats for someone who’s an amateur, but seriously trying to up their game. Even if you can’t rock them like a pro, you sure can let them make you look awesomely confident at every step. + Made of actual leather. + Excellent stability on the field. + They adapt to your fit after the shortest wear. + You barely feel them in action (except when it counts). + Light yet effective sole cushioning. After the disappointing features of the Phelon II, the Phelon III definitely upped the ante and offers you substantial improvements if you’re looking for something light and tight that will set you aside in any indoor court. The high-tech upper mesh on these shoes are excellent for breathability and conforms well to the shape of your feet. As an amazingly dynamic model, the Nike Hypervenom Phelon III (Indoor) is definitely what you want for agility and speed while playing indoors but not recommended if your feet are too sensitive. + Many vibrant and colorful designs from where to choose. + High-tech mesh upper allows for a better fit to your foot. If you like to strike and strike hard, the Nike Hypervenom 3 Tech Craft is just what you need to blast the ball away with fury and precision. It comes ready to give you amazing control at every step without the loss of speed which seems almost too good to be true. 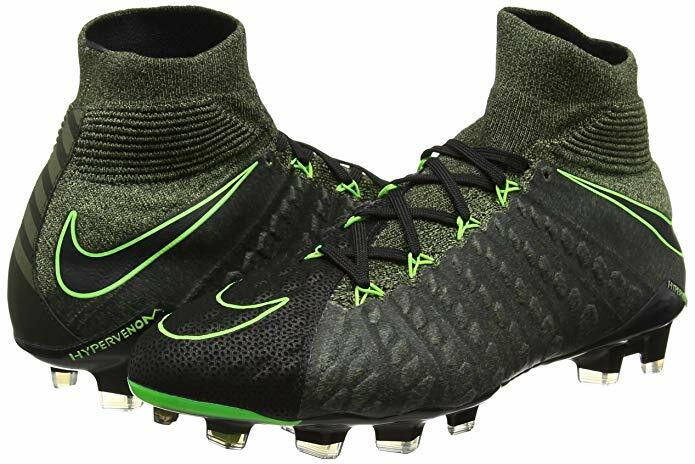 A superb model, the Nike Hypervenom 3 Tech Craft really delivers superior protection and comfort for the wearer, restoring the faith in the model’s capabilities (and in Nike’s designs). + Studs NEVER drag despite extensive use. This model is a bit controversial since it will offer you everything you need to pass as well as you can but can complicate things if you intend to score. This is a model you need to try on for yourself and make sure it fits properly since it was meant to fit like a glove. It will give you an uncanny speed but the downside is that makes the scoring less precise. + Very quick breaking-in period. + Light as feathers due to special compression tech. + Make almost every pass easier and more precise. – Can make scoring difficult. – Uncomfortably tight unless you choose exactly the right size. 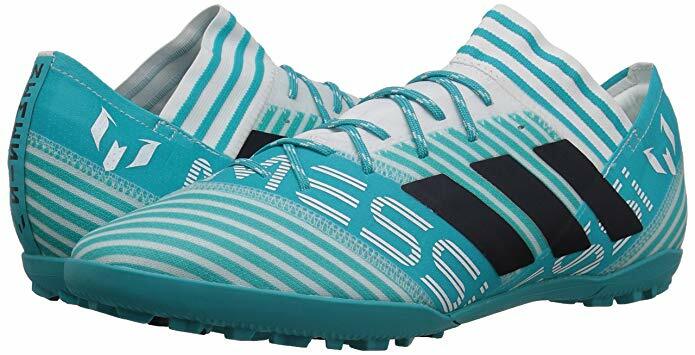 The Nemeziz is an extremely promising and powerful design that is definitely worth its reduced price if you’re ready to maintain it properly. These are the type of shoe you’ll buy if you play once in a while and don’t feel like spending a ton of cash on soccer gear. If you love to take care of your turf soccer shoes then you’ll have no problem getting the best performance out of these. Just remember – they’re delicate and you’d need to follow care instruction set out by the manufacturer. Properly taken care of, they’ll put a rocket on your feet. + Doesn’t skimp on the padding despite being a light model. The evoTOUCH was designed for the semi-regular player who wants something comfortable, affordable and balanced when it comes to performance. 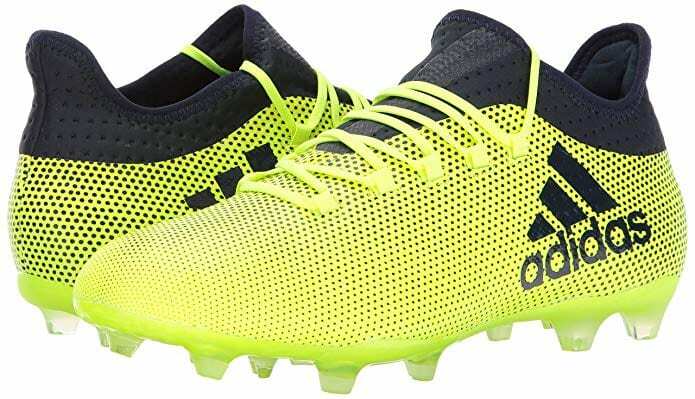 I would say this is a great all-around soccer cleat that’s not meant to distinguish itself in any particular trait but to offer a solid performance all around. This model is almost perfect…except for a literal Achilles heel that drags down the overall performance. The heel was tighter than what I’d have liked. I also found that the fit was slightly narrow and it also has limited padding on the front compared to other models. 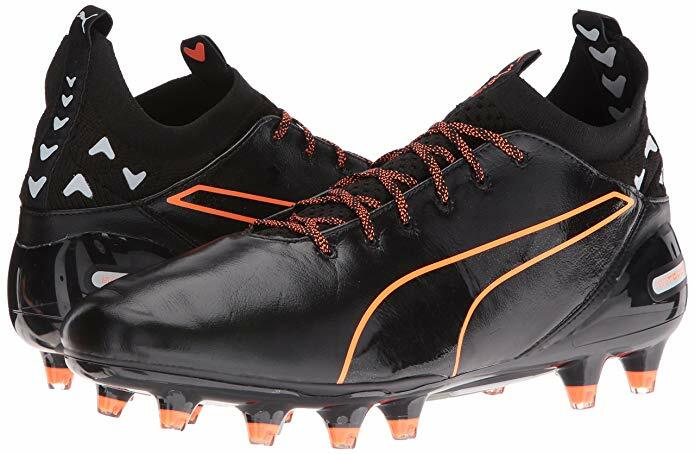 Having said that, the evoTOUCH Pro FG is a great cleat for almost every kind of player and shows what kind of Puma soccer cleats you can find out there, but you need to be careful with the heels unless you want some pesky blisters. + Soft and comfortable leather upper. + They offer excellent control and stability. + Rear and front tabs make fitting very easy. + EvoKNIT knitted sock offers excellent fit. – Excessively tight on the heels which can lead to blistering in the area. – You really feel the impact while striking solid shots due to limited padding in the front. If you’re looking for a sensibly priced and extremely comfortable pair of soccer turf shoes that evoke the greatest moments of its predecessors then the Gloro 17.2 is definitely one you should consider. It’s not interested in being particularly flashy or wild, but it does bring to mind everything that made the previous Gloro models absolute favorites among the fans. Adidas tried to bring back the glory of an old classic with this new version of the Gloro and it mostly succeeded while maintaining an affordable price that’s much welcome amidst so many expensive models. + The soleplate is made of very flexible polymer. – The flap tongue can be a bit too much, especially if you don’t like them that big. If you ever wanted to feel almost barefoot while playing indoors then the Adidas Ace Tango 17.3 Turf could very well be the answer to your prayers. It’s meant to be extremely functional in almost every aspect whilst also taking care of your feet’s comfort. The Adidas Ace Tango is probably the most comfortable and pleasant indoor soccer cleat you can buy these days. You won’t believe it till you wear them and you’ll just have to endure some minor discomforts as it adapts to your feet. + Extremely comfortable upper that gives a unique sensation to the feet. + Offers a particularly good ball touch during shoots and passes. + Adapts great to both wide and narrow feet. – The colors can fade quickly in some rare occasions. – May pressure the heel excessively during the breaking-in period. Under Armour Soccer Cleats are not the first thing that comes to mind when looking for something comfortable and with great traction. So if you want to give these underrated beauties a chance, you probably won’t be disappointed at all with the performance you’ll get from them. Under Armour decided to go all-in with this model and the final result is extremely impressive, proving that the brand is ready to make a name for itself and probably get some of its competitors deservedly nervous. – Can cause some heel blistering. Nike tried to keep its customers happy with this model, delivering good traction, comfortable wear and improved durability as its main features. As a very resistant and comfortable indoor turf shoe, the MagistaX Proximo II is absolutely perfect for those with sensitive feet or some type of injury that still want to play a bit (probably despite the doctor’s objections). You can batter and bruise these as much as you want since they’re meant to take a beating and still come up on top. + Flyknit upper has bumps which allow for awesome ball touch. + Traction is solid and reliable. 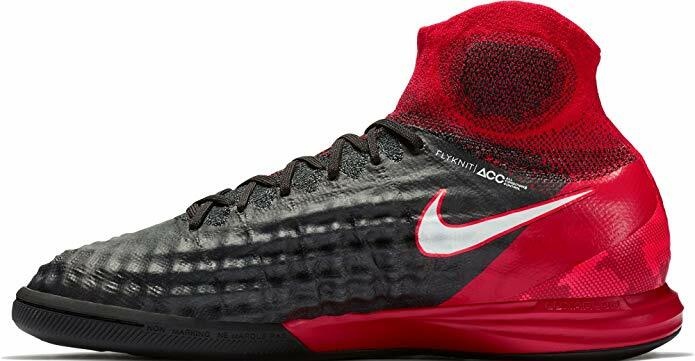 + Non-marking outsole protects gym floors. – Lacks All Conditions Control (ACC) technology unlike other Nike models. Purpose: Are these shoes meant to be used regularly or just every once in a while? Anatomy: Your feet are unique, treat them as such and choose a model that befits them as well as possible. Position: A defender probably won’t use the same shoes as a midfielder so take that in mind when deciding. Style of play: If you love passing and running then you’ll need to focus on a light model that favors speed, while a powerful striker may want something with a bit more padding and traction. All of these are key when deciding what will suit you best, but odds are you just want to enjoy a good game with friends every now and then without worrying much about your shoes. Still, you should have at least three pairs of soccer cleats in good condition. One for indoors games, one for turf games and a final one with enhanced traction for games in slippery grass. So, you went out and bought the best soccer cleats you can find. But, how do you take care of them so they remain in top condition? A good place to start would be by knowing the strengths and weaknesses of your soccer shoes. 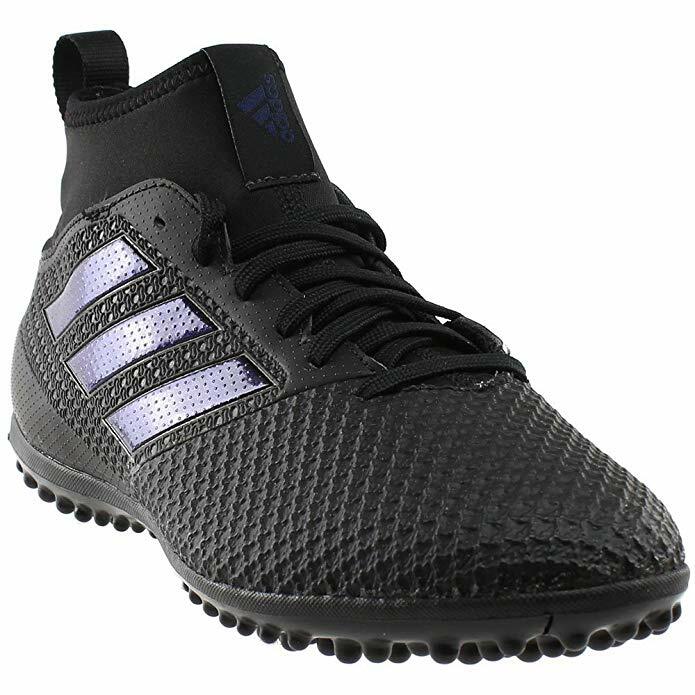 A lot of people think their usual turf soccer shoes will provide the same traction under all conditions but that’s not the case and as soon as it starts raining and the ground is saturated with water, the sole can slip faster than you can imagine. That may or may not require you to change shoes since a lot of turf cleats are both waterproof and tested under extreme conditions to maintain good fixation and traction, but nevertheless, there’s going to be some loss of grip (you can’t beat physics). The “hot water” myth is extremely popular among amateur players to help speed the breaking in process, but it’s something you want to avoid at all costs since even the best shoes are not designed to be submersible. Make sure to dry them properly after a game but do not expose them to heat, especially if they’re made of leather which can be extremely sensitive to temperature variations. The good old newspaper/magazine trick will always do since it absorbs moist from inside the cleat without any complications. Just like you don’t want to get lazy with your training and your game, you also need to maintain a decent discipline when it comes to keeping your soccer cleats clean, dry and only wear them where you’re supposed to. 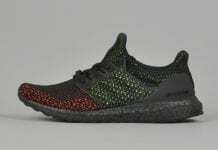 No doubt they look awesome as streetwear, but trust me, they’re not meant to endure the punishment of sidewalks and pavements, so even if it seems a relatively short distance, change to your everyday footwear and protect both your feet and your shoes. Remember, every properly maintained soccer cleat will last longer and save you money and pain in the long run. Choose well and have fun!